The Senior Volunteers/Researchers will lead the walk from Caldecott Mrt to Bukit Brown Cemetery via Lornie Road. Started with tomb occupied personality at the time, we shall conjunction the history of Singapore with tombs. 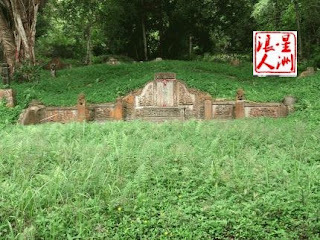 Republican Vice Chairman See Wu Ih, Tan Kim Ching, Cheang Hong Lim, Principal of Gong Shan School Lim Chek Yang, Lim Chong Pang, Anti Red police officer Wong Chin York, a tomb inscription written by China President Lin Sen, ......and many more. Please bring along your umbrella or raincoats, water bottle, insect repellent,covered shoes and proper wearing. Please note that the walk end around 12pm at Bukit Brown, advice to bring along your Easylink Card.